Sysco Healthcare provides organisations with a secure platform to manage day-to-day relationships and interactions with suppliers and employees. Sysco’s Healthcare platform is a digital transformation solution that unifies and provides a single view of various departments within a healthcare organisation. Streamline all interactions across your healthcare organisation. Manage Business Procurement, All Service Cases, Human Resources and KPIs from a single unified dashboard. Sysco’s Healthcare Solutions provides the ability to add Web Portal Access for Internal and External Service Users. Provide methods for Procurement Requests or Supplier Registration. Sysco Healthcare enables any department to track new and existing business suppliers; from acceptance and on-boarding through to procurement and monitoring of service delivery. Sysco’s Healthcare Solutions provides a comprehensive audit trail of meetings, emails phone calls, scheduled tasks, notes across suppliers, contacts, employees and cases. Sysco’s Healthcare Solution provides a complete document management solution for storing information against suppliers, contacts and employees. Sysco’s Healthcare Solution helps teams make every contact engagement count whether on PC, tablet or mobile. Track activities, record and update data or submit requests. Map case management workflows into Sysco’s Healthcare solution. Develop better communication and collaborative tools with ease. Gain insight via the Relationship Assistant. Sysco’s Healthcare Solution and it’s parent company Sysco Software Solutions have been providing healthcare solutions since the 1980s with clients in both Ireland and Northern Ireland. A Partner and Application Platform you can trust. Since 1980, Sysco have developed a close relationship with Microsoft and are a globally recognised Gold Partner in the delivery of Financial and Relationship Management solutions. 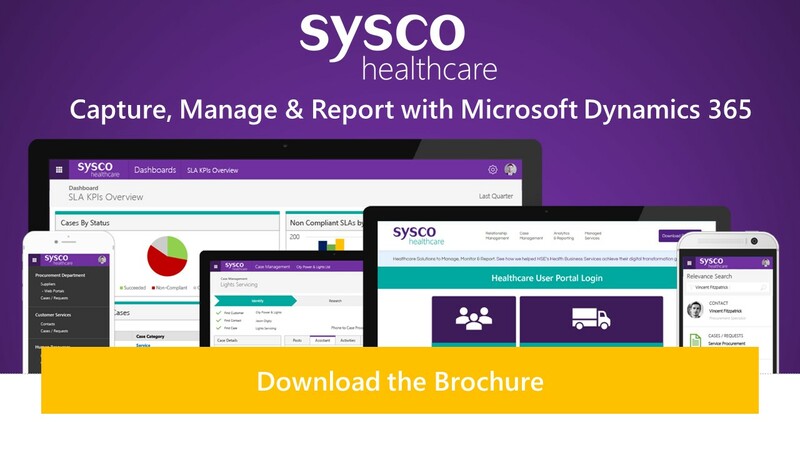 Sysco Healthcare and it’s parent company Sysco Software Solutions are active on the following Government Frameworks and are recognised globally as one of Microsoft’s Gold Partners in Microsoft Dynamics Customer Engagement and Resource Management platforms.